Twinnery is a visual recognition game in which players scan the themed panels on screen and spot the matching objects before their opponent does or before the time runs out. Twinnery improves visual perception and concentration. Funny Yummy is a kind, calm and entertaining book app for toddlers and children. The book heroes are cute little animals, each with his own story in a funny way will inspire your child for good healthy appetite. Sound Salad is a new kind of sound-object association game which trains concentration, attentive listening, imaginative and logical thinking. Kids help Mr. Ear to get out of the Sound Salad in which all objects’ sounds got mixed together. 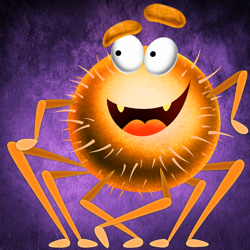 Wally is a wall creature, a naughty little spider who lives behind the wall and loves to hide from the player. While trying to catch the Wally, young players will discover many other creatures who live their small funny lives behind the wall of bricks. The Halloween edition of the popular Catch the Wally app. 5 new episodes in addition to the already familiar episodes, which got a spooky twist through new images, animations music and sound design.